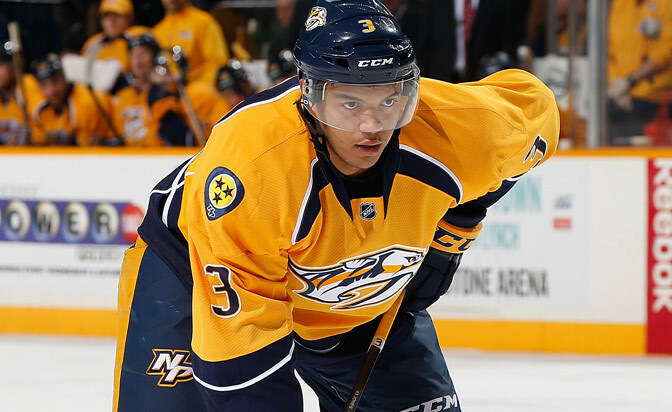 Nashville Predators defenseman Seth Jones was born in Arlington, Texas, and raised in Denver until the age of 12. Though Jones' hockey roots were cultivated in Colorado's capital, it was in suburban Dallas where it bloomed. He evolved into a promising defenseman in the Dallas Stars' youth program and eventually became the No. 4 pick in the 2013 NHL Draft. Once settled in Frisco, Texas, Jones began his first year with the Stars' bantam major team at the age of 12 playing with kids a year older, always a preference during his preteen years. "That was obviously a great experience for me to come in that first year and really get pushed," Jones said. "They built rinks in great areas, the one in Frisco I lived right next to. The Stars' practice facility was a great rink. There are many more rinks that I played at as well that were easy to get to. They were nice, they were clean, and you didn't have to go far to get to the ice rink." By the time Jones' adolescent years were nearly complete, he was captain of the Stars' under-16 team before joining the U-18 program the following year to attract the attention of the U.S. National Development Program. Playing against kids who were two years older when he was a 16-year-old accelerated his development. "This was definitely a learning curve," Jones said. "My assistant coach there was [16-year veteran NHL defenseman] Craig Ludwig. He taught me a lot of fundamentals about the game, what not to do and what to do in certain situations. I'm really glad I had him there to really teach me." Jones' accelerated development occurred when hockey had a secure foothold in Dallas. The Stars were perennial Stanley Cup contenders since relocating from Minnesota and won it all in 1999. Fans packing Reunion Arena and later American Airlines Center served as proof of the sport's rising popularity in Big D.
Mike Modano, a Stars legend, was the pioneer for hockey's grassroots campaign in Texas and the state's chief role model of the sport. He set the foundation for the ongoing education and growth that continues today. "It definitely helps when the pro team is doing a great job," Jones said. "The attitude that they bring on the ice also transfers in the fans which transfers into more kids wanting to play the game. Many kids grow up with Modano jerseys on and want to be Mike Modano. I think that definitely helps the sport as well, when you have someone like that you can look up to. "The game is going to continue to grow. It may not be growing as fast as a Minnesota or a Detroit, but it's definitely gaining players every year and I think that's going to continue to happen." Currently the Dallas Stars' executive advisor and alternate governor, Modano's latest commitment to promoting hockey in Texas takes root Saturday following the team's 3 p.m. CT game against the Tampa Bay Lightning at American Airlines Center. The franchise and USA Hockey will host Try Hockey for Free Day, a national effort to have more than 500 local rinks and associations introduce kids between the ages of 4 and 9 to youth hockey. The endeavor is part of Hockey Weekend Across America, aimed to promote the game at a local and national level. The Stars will provide helmets and skates for what's expected to be a crowd of as many as 2,000 kids to take the ice in 20-minute increments. Registration for the event is available at TryHockeyForFree.com by selecting American Airlines Center as your preferred location. "It's the idea of giving kids access to ice hockey down here," Modano said. "Up north and the Midwest, obviously, they have a favorable winter, and they have tons of rain. Down here we don't have the ability to have rinks outside. It's been a hard push towards this date where we can get kids to the rink and we can make it as easy as possible for parents to get their kids equipment, get them ice time, and just to introduce them to the game of hockey and see if there's any attraction there or anything that sparks a little flame in them that they'd want to come back and get a little more involved, a little more deeper." The highest-scoring United States-born player in NHL history, Modano is proudest of his leadership efforts in growing hockey in Texas. In 1990-91, two years before relocation, there were 868 registered youth and adult hockey players in the state. By 2010-11, the number had increased to 11,661. Today there are 10 rinks and 11,560 players in the Dallas-Fort Worth area. The Stars anticipate that number to grow rapidly over the next two years with the inclusion of their Little Rookies program, which will introduce 2,200 kids to hockey annually (five sessions each comprising of 440 children) and run in 12 ice facilities across the state. "That was one thing I tried to get involved in as much as I can, trying to get kids introduced to the game of hockey and get families involved in it," Modano said. "That was the hardest thing for any kid growing up, the sacrifices and commitment the parents take alone." The growth of the game in Dallas has been steady, though it wasn’t far into his first year that Modano understood it wasn't going to be easy educating citizens living in football country about hockey. It was hard enough to comprehend an NHL franchise leaving Minnesota, but when he learned in 1993 that the Minnesota North Stars were to become the Dallas Stars, he was incredulous. "It was crazy enough hockey wasn't working in Minnesota, but it was crazy enough to think it would work in Dallas," Modano said. "The game's never been played down there. There's never been any talk about Dallas. Are we going to be constantly teaching people down here for the rest of our careers what's a puck and a stick and this and that? We really thought the worst when it was first announced we were going down there." Winning certainly helped. The Stars went on to make the Western Conference Finals three straight seasons, including back-to-back Stanley Cup Final appearances, and won the Cup in 1999. It was a time the team could do no wrong. "We could lose 10 in a row or win 10 in a row; I think people just viewed the game and the sport as the same," Modano said. "I think once [Tom] Hicks became involved and bought the team, and [Ken Hitchcock] came in and got the head coach job, and Bob [Gainey] moved to general manager, I think at that point we knew the chain of command changed a little bit, and the expectation level went really high. "People just went bananas for playoff hockey. They really couldn't imagine the way Reunion Arena was, the atmosphere, the crowd, everybody stood up the whole game; for every playoff game they stood from start to finish. We were just taken back. We couldn't believe it."